Champagne Conditions for Last Night’s Racing! Graham, and Mike R. on the big boat and Porter and Eric Re. on the crash boat. Thanks, race committee, for getting the races off. The wind gods threw a bit of everything at us, from winds in the high teens, perhaps brushing 20 for the first two races to much more moderate conditions for the last two races. This was a far cry from last week’s burn down of withering gusts, and much more enjoyable. The race committee ran two single lap races, nos. 1 and 4, sandwiching two, two lap races. The last race started just before sundown, ending after sunset. That’s called getting your races in!! There were some capsizes last evening in the first two races, but not none too serious. And the funny for the evening was in the last race when Eric Roman’s hiking strap decided to part ways with him at the finish line! He went over the side — and the boat went over with him. Lots of guffaws on that one! Our fleet is a competitive one. Before the start of the first race, the Young Wizard commented to me “This is a good fleet — lots of people can do well.” And he’s right, our fleet is competitive because of people like Griffin who share their knowledge. The evening was dominated by Chris who borrowed one of Forest’s sails work his way to the top. His big concern was whether Forest was going to jack the price up on the sail! And this should have been first — steer precisely. Watching Chris is a joy because he balances the boat perfectly through his steering. He is often feathering the boat to keep it flat. But he also does all of the preceding stuff, too!! Downwind, don’t let the Vang all the way off when it’s really cranking. Your steering options get too limited when the Vang is too loose. Keep about a 10″ tail on the Vang downwind when it’s blowing. When you jibe is critical! Don’t jibe when a gust is hitting you. Jibe either before it hits you or after you are going full speed. The boat is massively powered up when its accelerating, so even when you are going really fast, you have a better chance of pulling off the jibe than you do when the boat is accelerating, as when a gust hits you. Griffin will do a pictorial in an upcoming newsletter showing you how to get the most out of this control line. It’s show time, folks!! The weekend of May 19 and 20 is it. Please contact Griffin if you either want to sail or can help make this a great show for us. Dues Please pay your dues. We will post a naughty and nice list next week. Be on the nice list!! Greg is the man. Racing on Wednesday, May 16 Next Wednesday will be our last tune up for the No Coast. Our race committee will be GRIFFIN, CAN YOU FILL IN, PLEASE? Big Sail Out — June 6 Let’s all shoot for June 6 to have as many boats on the line as possible. Bob Gough will be running the show, so it should be spectacular!! We have been waiting for strong winds this season on a Wednesday night, and they finally appeared last night. It was solidly in the low 20s with some withering gusts thrown in. With the higher wind speeds, the shifts weren’t as large as we have seen in recent weeks. Surprisingly, the chop wasn’t very big despite the wind being from the south. But boy, those gusts!! Whew!! We had a lot of people out of town, so our numbers were way down — only Cullen, Chris, Doug P., and myself hit the water. Overseeing us were Jody, Annette, Greg, Eric Ro., and John E. Thanks, race committee!! The story of the night was damage control. The first race, a two lapper, got underway with me leading at the first weather mark. My plan was to sail by the lee, which worked well until I tried untangling my cunningham which was wrapped around my main. My main slipped out of my hand, and it was deathroll city. It took a long time to get the boat back up, but I got her going again. Cullen had some issues downwind, too, but Chris and Doug P. had none. Doug P. was launched, but I was able to catch Chris at the second weather mark, but I had to tack and wait for him to clear me to round the mark. That allowed him to launch on me. I got a huge gust, but I was on starboard going away from the leeward mark, and I was not about to jibe in it! Chris was on port when the gust hit him, and he spun out, allowing me to get past him. Turns out the violence of his spin out stressed his vang attachment on the boom to the point that it was a matter of time before his vang failed, so he sailed in. Race 2 was a drag race between Doug P. and me to the left, and I was able to keep my height on him despite not being as flat. So I led at the mark and turned the corner downwind. The wind was very up and down. I was sailing by the lee with my vang off but the main sheeted pretty tight. I saw the gust of the night coming down when I looked back. I didn’t realize it was the gust of the night, and boy, when it hit, the boat loaded up in a manner to which I am not accustomed and the boat simply spun out. In retrospect, I should have had the vang tighter to give me more options with the main. I had to do the double capsize to get the boat back up, whereas Cullen didn’t turn over. I decided to just point straight to the mark and wildly planed to it, rounding just behind Cullen. Experience paid off for the old fart, but Cullen did a great job. Race 3 was much the same as the second race with Doug and me going left. Doug was able to work up to me, but not until I was on the layline to the weather mark. The finish was downwind, and that was the night. Doug toyed with us like a cat with a mouse all evening. He is preparing for another WC, and his boat handling was super. After sailing, Mike Rist rode up on is bike, and John Oliver showed up, too. Jody, Annette, John Oliver, and I hit Lake House, capping off a fun evening. 1) Tight vang!! You need a ton of vang going to weather, and you have to find a method that works for you to tack with a super tight vang. For me it’s going to my knees during the tack, overrotating, and sheeting out a ton so as not to stall. It worked. Oh, and how you rig your vang is critical. Ask Griffin for tips to utilize the entire scope of your vang. 2) Tight cunningham!! Depower in those puffs. 3) Work the main in the puffs!! If you have a super tight vang, you can sheet out in the puffs, keeping the boat flatter and accelerating as opposed to standing on your ear, which is not fast. 4) By the lee downwind is stable, but not having enough vang is a fool’s errand. 5) Practice recovering from a capsize. Everyone turns over. 6) Keep your lines separated. When it’s honking, the tails on the cunningham, vang, and outhaul get long, so keep your working area clean and the lines away from each other. It’s almost here, folks!! The big weekend is May 19 and 20. Sign up ASAP if you plan to sail and save yourself some dough as there is a $25 late fee fast approaching, and if you aren’t going to sail, volunteer!! This is OUR showcase event, so please step up. Go to Facebook to sign up. Laser Nationals To be held at HYC in late June, but let’s get past the No Coast first!! Dues See the handsome man with his hand out (Greg), and slap $50 in there. Clinics More are being planned, so stay tuned!! Ideas If you have an idea to increase participation, let Griffin, Tim, Eric Ro., or me know. These little boats are a blast, and we need to get people to use their boats. It’s fun, the camaraderie is great, and it gets you outside, away from a keyboard. You can’t beat that!! Big Wednesday Night Throw Down! Only 29 days until our big night on the water. Tell your friends. Get your FS buddies lined up to sail! Racing tomorrow evening Racing should be spectacular tomorrow! Get that boat out. Last formal racing before the No Coast. RC is Mike T, Porter, and Eric E. 6:30 pm horn. Last night we had seven boats on the line, including Griffin, David, Forest, Eric Ro., Chris, Brig. This was a pretty impressive turnout given the horrible weather right up to start time. Rainy, cold, and generally miserable, the weather was a real deterrent. But lo and behold, just as the old guy was ready to bag it, the winds calmed and warmed considerably. As the evening progressed, it got nicer and nicer. The Young Wizard’s thought that we should make sailing a game time decision was quite prescient. The wind was from the northwest, and it was streaky, puffy, and SHIFTY. Several people were auto tacked, and I heard Griffin exclaim “I almost turned over!” when his turn in the auto tack barrel came around. The issue was the big shifts came when one was fully hiked. Last night wasn’t a boat speed race as much as a being in phase and pressure race. As a result, there was a lot of chutes and ladders going on, and everyone was leading a race at one point or another. And the competition was very, very tight — big changes in position were seen regularly. We got in three races, two single W/Ls and a final two lapper. It was simply a marvelous evening of spring sailing in Dallas. Of course we couldn’t have done all this without a race committee. Tim led the charge, which included Chris’ adorable daughter Brixton, Greg, Mark M., and Karly. A special shout out is due Miss Karly given she did her best Tammy Wynette and stood by her man helping out on race duty when it likely wasn’t her first, second, or fifth choice for her evening’s activities. Thank you to all of you! After racing, the crew went to El Vecino for the fine Mexican cuisine. Christof joined us as he was working on getting his boat, graciously loaned him by Steve Comen, together. And we had a most special visitor from the south, John Oliver, looking tanned and relaxed back from Panama. We had three lasers sail in the Commodore’s cup with many other laser sailors in other classes! We had Greg Wallace come in first place sailing a full, Jim harris and Christof Bussen tied for second with Jim sailing a radial and Christof sailing a 4.7. Conditions were difficult with winds shifting constantly and routinely gusting well into the 20’s. Sunday brought blustery weather with temps in the low 60’s and a strong north-west breeze, but this did not deter Greg from steering Captain Snicklefritz to a straight bullet win! 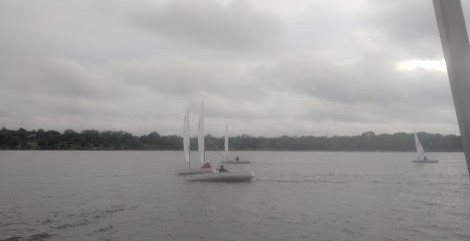 Conroe Spring Fling Regatta — this weekend This is a Laser circuit regatta. The regatta chair will welcome anyone up to the start of the regatta. Dues Please get $50 to Greg ASAP. Alex was conspicuously absent as rumor has it he was negotiating with a concert promoter to bring Justin Timberlake to one of the get togethers. So this is some high tone stuff! Get your money in! Big Push for Fleet History! We are only 41 days from our June 6 attempt to break our old record of 33 on the line. Talk this up!! Change in Starting Time for Fleet Racing! Beginning May 2, racing begins at 6:30. Race duty is scheduled to be Jody as PRO with John E and Eric Ro. in support. What a week for the fleet! Spring weather has arrived, and with it, wait a minute, WIND! Woo hoo! So much has happened in a week, this will be longer than normal. Read on! 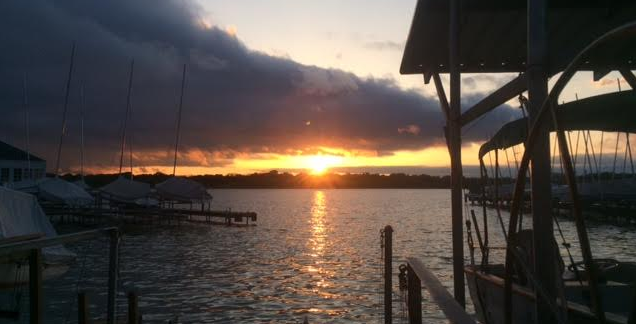 It was a PERFECT evening to be on the water! Warm wind, cool water, and a great turnout. Sailing were Brian Blumner in a loaner, back-to-Dallas from Portland David Valentine, Christof getting his feet wet, Alex, Griffin, Chris, Jody, Brig, Tim, Jack, Eric Ro., Aublin, and Forest. Mike M. and crew set great courses for the four races held. Cleansweep 11 swept up for the night with two firsts, so the Young Wizard had his mojo working. His wand (tiller) must have an unusual feather in it that conjures magical wind seeking powers as he continued his love affair with the west side of the course to his advantage. Awesome! Alex won a race in a borrowed, unfamiliar boat, and Brig won a race in the battle of the olds, just nipping Jody. The wind was a far cry from what it had been the prior week — there were times to actually not hike hard! And the competition was fierce! The shifts and pressure changes meant going from hero to zero. And the level of competition has increased with our additions! After racing, the gang went to Lake House for its fine cuisine. Going to dinner afterwards is often the highlight of th evening. It was SO nice outside where we sat that Eric Ro. noted that the heaters weren’t on! Simply marvelous. Wind was smoking and Griffin, Eric Ro. and Alex rigged up and sailed in winds gusting in the 30s. The Young Wizard was using his dual Gopros and caught some amazing off wind action with the best of it being Eric’s stunning DEATH ROLL. Please see screen capture here, but for viewing pleasure, Click Here: https://www.youtube.com/watch?v=LSAoR2saWyM. There was some serious smoke coming off those boats! 7 intrepid sailors visited Viridian in Arlington to sample the club’s Aeros. Winds were ranging from 15-30 with capsizes a plenty before racing was cut short after Mark Babb’s boat decided to boot its skipper and try to sail itself!! Oh, and Eric Ro. applied the leather to the fleet and won the abbreviated regatta going 1, 2. Death roll, shmeth roll, says he!! Way to go Alex, Eric, Andrew, Mark, Zach, Griffin, and Jack for representing the Dallas Laser Fleet well! Five sailors, including Eric Re., Porter, Christof, Jim, and Taylon, rigged up for a clinic run by our fleet captain, Griffin, who put Cleansweep 11 aside to work with our folks on the basics. He was ably assisted by Alex and Tim. While the wind was a bit on the heavy side (see headline of this newsletter! ), Griffin told one and all to show up. The fleet loaners were pressed into service with radial rigs to make them more forgiving. Well, there were still a few capsizes, but smiles aplenty! This is the first of three to be held before the No Coast, so be on the lookout for more dates! The second Wednesday Night series group of races were held last night in winds that were very up and down as well as streaky and shifty. Kind of like last week, but on steroids!! Average wind speed likely in the teens, but there were some big blasts, too. We had Griffin, Chris, Tim, Brig, Alex,Eric Ro., Eric Ri., Cullen, and Jack out for the four races run. Zach and Alex had boat issues; Zach had to make his way in with a leaky boat that didn’t allow him to get back out on the course, and Alex broke both his gudgeons while still on the dock. Alex hopped in a loaner, missed the first race, and then applied a whooping to the fleet in the last two races. As the sailors rigged, Chris opined that the wind conditions were such that one’s boat handling abilities would be tested. He was right! Most people turned over at some point. Having flipped in the double digits, I can report that the water wasn’t too bad after the initial shock! The last race was epic. Eric Ro. rounded first with Chris on his tail, and Brig rounded with Alex and the Young Wizard in a pack. Alex and the Wiz split with the others and went hard right to the west shore where they found a major, major streak that had them plane all the way to the leeward mark. Chris asked “how the heck did those guys get up there? !” It was an incredible sight seeing those two have their way with the wind, going from 20 yards behind to 100 yards ahead! Such is the power of being in pressure!! Thanks to Forest’s group for running the races. The third race was a two lapper, and it destroyed the old fart sailors. When the last race was changed to a one lapper, the sexagenarian likened Forest to a Biblical character, so happy was he to not have to do a two lapper!! It was really a fun, fun time to be on the water. It was a reminder that being in some sort of physical condition is a good thing!! Aero Saturday Our own Jack Hattendorf has invited our group to sample the Veridian club’s Aeros this Saturday, the 14th. Jack has a post on our DLF FB page. Supposed to blow this Saturday, so come see the facilities, give the boat a whirl if you’re up to it, and have fun with your friends. It’s BYOB apres sailing. Commodore’s Cup This event will be held at CSC April 21 and 22. Please sign up on the club website. ALWAYS a fun time! And for those so inclined, there is generally a keg of adult libation available (all in moderation!!). Conroe Spring Fling Regatta The third stop on the District 15 Laser Circuit will be held April 28 and 29. Contact the Laser District 15 Secretary and Fleet Captain of the DLF, Griffin, for more info. No Coast Regatta This is OUR regatta of the year, to be held the weekend of May 19 and 20. Please sign up (link on the DLF FB page (no, signing up on the FB page will not put you in the NSA’s cross hairs!)) to help our regatta staff plan. Griffin is reaching out to his buddies in NY to come down and sample the club hospitality, so let’s all make them feel welcome by having a great regatta. A great regatta starts with us signing up. Dues Please get $50.00 to Greg Wallace for this year’s dues. Several social events are on the calendar, and they should be high tone given the social chairman now drives a freaking Mercedes! So the money is well worth it as it also supports the loaner program. Mike M. and John E. are on the schedule for duty next week. We will have a revised schedule soon to account for the need of a third. Boat Call Up Only 55 days until our bang up attempt to break 33 boats on the line for a Wednesday night. That’s June 6, 2018. Tell your buddies to dust their boats off!! Clinic!! The Young Wizard has taken the step to hold a clinic for folks new to Lasers or who have recently purchased boats. This will be GREAT as it will accelerate one’s learning on these nicely performing boats. He will cover boat balance, sail trim, and little tricks of the trade. The date is Monday, April 16, at 6 PM. Contact Griffin via the fleet email if you’re interested. This will be the first of what we hope will be several this year to increase one’s enjoyment of the boat and sailing in general. Last night we had a meeting to elect our new fleet officers. Griffin, our young wizard, will work his magic on the fleet in his new role as Fleet Captain. He takes over from Tim whose service is greatly appreciated! Griffin was also announced as our fleet champion for 2017, followed by Jody Smith, and Tim. Good job, guys! More to come on that front…. As has been posted here before, we have two big events in the offing, the opening circuit regatta, the Easter Regatta, to be held the weekend of March 31 and April 1 hosted by our pal, Fred Schroth, and the BIGGIE, the No Coast Regatta which will be on our lake May 19 and 20. Jody is heading up that huge effort, and I know he would very much appreciate your signing up early to give him a leg up on planning. The three methods of communication I will use in descending order from most to least: FB, email blasts, and the web site. Please keep visiting here as it’s the most expedient method of communication, and I promised to write something every week! The scored Winter Series is underway! Come out Saturday and sail with us. First gun is 10:30am until December. Then, it is noon. We will sail three races with the Butterfly fleet. The season will continue until Spring. The Arlington Yacht Club is hosting the next district event at their NEW (temporary) home on the Ft. Worth side of the lake. Check out their NOR here and then registeronline here. 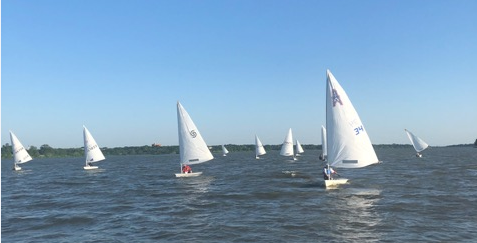 Series 1 of our local Dallas Laser Fleet racing concluded, and it was a success! The weather even cooperated more for us than for many with only one rain/flood out! Scores are in process of being updated, but it does point out that our scorer, Owen, needs to get a copy of the score sheet from the responsible race committee person ASAP upon completion of their obligation. A few of our folks have traveled to D15 events thus far, which are always fun. These regattas provide a different environment than good old White Rock, and they afford us an opportunity to meet new sailors, which is the most fun of all! The next event will be in Palacious August 22 and 23, so take note and give it a whirl. One point needs to be hammered home: We as a group and individually need to be mindful of the weather. Going sailing when storms are in the area without a rescue boat in the water, manned and ready to go, is not sensible. Be aware of the radar and check for thunderstorms before you go out. Also, we are in the summer season, and it is HOT on the water. Make sure you have plenty of water on your boat, and drink it whether you’re thirsty or not. If you wait until you’re thirsty to drink water, you’re already a bit behind the eight ball. Series 2 of our local series is well underway, so come on out! Looking forward to seeing each of you on the water soon. The schedule Wednesday night racing schedule is up. First gun is 6:30. The District 15 schedule is up too.